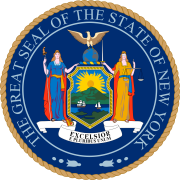 The 1820 New York gubernatorial election was held in April 1820 to elect the Governor and Lieutenant Governor of New York. Governor Clinton was the incumbent. U.S. Vice President Tompkins had been governor from 1807 to 1817. Tompkins would be re-elected vice president, in November 1820. Note: Tompkins was the sitting Vice President of the United States.